Fleet W. Maull: When I arrived here in December, 1985, I was immediately struck by the amount of suffering. Out in the yard and in the halls you see people in wheels chairs. You see people using canes, walkers and crutches, people who are obviously emaciated from cancer and other illnesses. Even though I was overwhelmed by being sentenced to 25 years in prison, I was still struck by that sight. It was [actually] helpful for me to realize that a lot of people had it much worse than I. It really moved me, and I wanted to find some way to help. Also, at that time the AIDS epidemic was just coming to light, and among the prisoner population, people were very upset and scared. Prison administrators were trying to figure out how to deal with their HIV-positive inmates. Originally they were isolating AIDS patients in a special lock-down unit, more to protect the patients than for any other reason. There was fear of reprisals from the other inmates, who weren’t thinking very clearly and hadn’t been educated about the disease. Marty Moss-Coane: How did you become interested in hospice work? I was working with a service organization, showing movies in hospital wards, including that lock-down unit. I was meeting these men and became concerned about their plight, so I started writing to various AIDS organizations for information to see if I could somehow be of help in here. M: How did you go about trying to create a humane environment for the dying and the sick inside of a prison? F: Well, the program here [the Springfield prison hospice] actually began with the inspiration of another prisoner, who was a paraplegic patient. He was living on the hospital ward and got to know several patients who were dying, one was dying of cancer and another of AIDS. He befriended them, got very close to them and stayed with them through their deaths. He saw what a tremendous need there was: these men were basically dying alone. He felt there was something other people could do, so he started talking to the prison administration about [a hospice program] and I offered to get involved. We began training in 1987, and in January of 1988 we started seeing patients. To begin with, we just try to be a friend. Often you become a surrogate family member, just being there so the patient knows that someone cares. We can’t change the physical layout of the prison hospital; we can’t immediately change the typical attitudes that exist in a prison. But we can be a friend, so they know someone there cares about them. That’s really what the hospice was to begin with: just to be there for the person. It has evolved into more than that now, with more nursing and medical staff involvement. M: Do you think a dying inmate wants anything different from someone else on their death bed? F: What a dying inmate wants is not to be dying in prison. He wants out. Dying in prison is, in some sense, the ultimate mark of failure on your life. The greatest hope [for dying inmates] is to survive their illness until they finish their sentence, or to receive a compassionate early release, which happens in a few cases. They want to be cured, or let out to die. They don’t want to die in prison. M: Do you find that people want to confess things to you and share secrets of their life? F: In some cases. First, they don’t want to be alone, and many don’t want to die alone, but a lot of prisoners have a strongly developed ethic that you don’t talk about your business with anyone, and you don’t talk about anyone else’s business. On the other hand, some do have the need to share. They want someone to talk to, and they start sharing all of their life with you. There are others you’ll spend months with, and find out very little about them. [Occasionally] someone will want to get some things off their chests that they’ve never told to anyone. We’re trained to be ready for that and try skillfully to be there for them in a way that helps them feel comfortable. M: Is it hard to sit with someone and not talk? When friends of mine have been ill, some even near death, I myself feel the need to fill up the time with conversation, and sometimes that’s not what they want. So you just sit with them in silence maybe for a half hour or longer. You find that you can really settle into a very comfortable, peaceful place with them. This may be the one time they’re able to relax. Some patients, towards the end of their illness, are so afraid of dying, and dying alone, that they can’t sleep. They’re afraid they’ll die in their sleep. If you’re able to sit with them, sometimes they’ll use that time just to sleep. They can finally relax because they know that their friend is sitting there with them. And that’s one of the things that we emphasize in our training with the hospice volunteers here. M: Have you been with someone at their death and held their hand and been with them as they died? F: Yes, a number of times. It’s a very profound, humbling experience. M: Can you actually see life leave them? F: That’s something I’ve thought quite deeply about. A few times I‰ve felt that I was witnessing that transition. But more often, even though I‰m right there watching, they take that last breath and suddenly there’s no one there. The finality of that is very, very powerful. Here’s this person who’s just skin and bones, lying in front of you, but obviously there’s life left. Sometimes, as the body diminishes and wastes away, you become more aware of the being which somehow seems larger than what’s left of the body. There’s this life, this being there; then suddenly it’s just gone. M: So has hospice work made you think about your own life and death? F: Yes, quite a bit. It puts you very much in touch with your own mortality. Being here in prison and working with men your own age who are dying of cancer or AIDS, you realize it could happen to you, at any time. That’s pretty scary. You could suddenly have a pain somewhere, or feel sick, and go to a doctor. They run a test and discover you’ve got cancer. And maybe you’re not going to get out of prison, either. I had one patient, an AIDS patient. We’d actually become friends previously through the meditation group that I lead here. Later, when he became very ill, I was with him as a hospice volunteer for six months through tremendous, tremendous suffering. It was just horrible. We had a lot of similarities in our backgrounds, and I could identify with him very clearly. We’d both been involved in some drug smuggling and addiction, and he had a son the same age as mine. It was very hard for me to remain objective as I was working with him. A lot of what he was dealing with was the shame and the grief and the sadness over what he’d done to his son and daughter, and the legacy he was leaving them. As he told me things, I would be flooded with images of what I’d done with my own life and to my own son. It was very hard for me to stay focused and be there for him. This work is very powerful in that way. It puts you in touch with a lot. That’s why I feel very fortunate to have a contemplative practice [meditation discipline] to help me deal with and process all that. In terms of rehabilitation, I think some combination of a contemplative practice and service, helping others, is the most powerful thing we can do. It would be good if we could offer that opportunity to more prisoners. Helping others is the most powerful thing we can do to help ourselves. 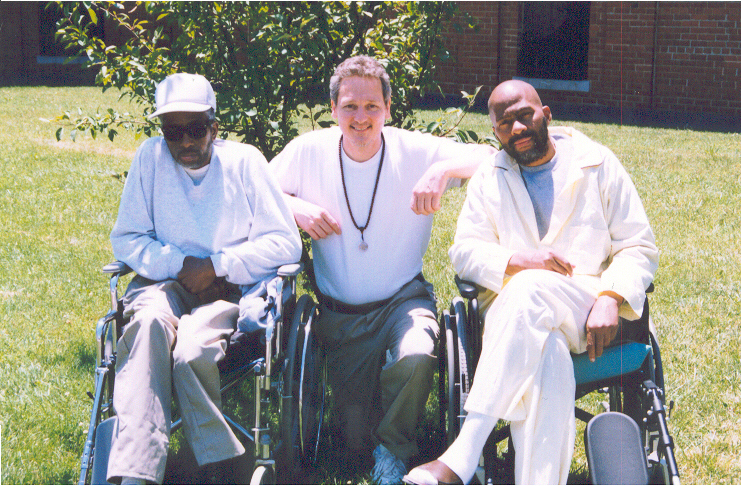 In 1991, Fleet founded the National Prison Hospice Association (NPHA). This entry was posted in Fleet Maull by Kate Casavecchia. Bookmark the permalink.